Original Editors - Nicole Clark from Bellarmine University's Pathophysiology of Complex Patient Problems project. Mononucleosis, also known as the "kissing disease," is a viral infection spread through the passing of saliva that causes fever, sore throat, and swollen lymph glands. Since the virus that causes Mono is transmitted through the sharing of saliva you can get it through kissing, but people are also if not more likely to contract Mono through the sharing of utensils, drinking glasses, or interaction through someone with Mono who coughs or sneezes. 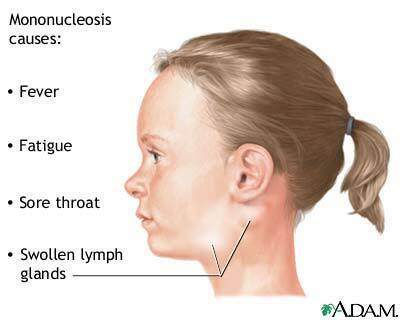 However, mononucleosis isn't as contagious as some infections, such as the common cold. In the research conducted in 2005, it was found that Epstein-Barr Virus (EBV) infects more than 98 percent of the world's population. According to the latest statistics in 2005 95% of people in the United States over the age 30 have been infected with EBV at some point, but may not have known. People in the 20's who have been infection will only present with symptoms 35-50% of the time. For those in their 20's that have lived in dorms or other close quarter housing the chance of infection increases. Mono occurs most commonly between the ages of 15 to 17, however you many develop mono at any age. Less Uncommon - may be signs of rare but serious condition. Patient's should be instructed to contact physician immediately. Mono is caused by the Epstein-Barr virus, a form of herpesvirus. EBV is one of the most common virus in the United States and does not disappear once symptoms supposide like some viruses. 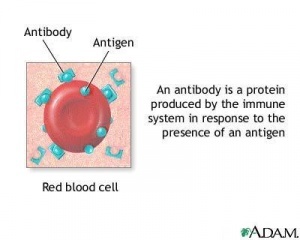 Some of the EBV cells remain dormant in their host for the rest of the patient's life. The virus is passed through saliva and close contact. It has also been shown that mono can be caused from other viral organisms such as cytomegalovirus. Mononucleosis is spread sharing beverages, utensils, lip balm, and most commonly known is kissing. Infectious mononucleosis can be caused from Acute Cytomegalovirus (CMV) infection, condition caused by a member of the herpes virus family. Once symptoms have subsided the individual is still caring the virus, it has just become dormant. A few of the viral cells will remain permanently and the person may have an acute flare up years down the road. Enlargement of the spleen is the most serious systemic complication that can arise from Mono. In very rare, extreme cases the spleen may rupture if not treated properly. This would be evident by sudden, sharp, stabbing pain in the left side of the upper abdomen. The liver may also become involved in some cases. Hepatitis, or inflammation can occur in some cases or the patient may experience jaundice which is characterized by yellowing of the skin and whites of the eyes. If any abdominal pain or yellowing of the skin occurs medical attention should be sought immediately. Infectious mononucleosis is probably contagious before symptoms develop until the fever subsides and the oral and pharyngeal lesions disappear. Although infectious mononucleosis appears to be only mildly contagious, adherence to standard precautions, especially good handwashing and avoidance of shared dishware or food items with other people, is essential in preventing the HCW from contracting this condition. The person with infectious mononucleosis should be cautioned against engaging in excessive activity, especially contact sports, which could result in splenic rupture or lowered resistance to infection. Usually this guideline is appropriate for a period of at least 1 month. Any sign of splenic rupture (e.g., abdominal or upper quadrant pain, Kehr's sign, sudden left shoulder pain, or shock) requires immediate medical evaluation. Any soft tissue mobilization or myofascial techniques necessary in the left upper quadrant, especially up and under the rib cage, must take into consideration the enlarged liver and/or spleen; indirect techniques away from the spleen are indicated. In rare cases mononucleosis impairs the CNS. Any change in neurologic status must be evaluated and reported to the physician. Changes in respiration or signs and symptoms of airway obstruction may require emergency intervention. Cosmopoulos K, Pegtel M, Hawkins J, Moffett H, Novina C, Middledorp J, Thorly-Lawson DA. Comprehensive profiling of Epstein-Barr virus microRNAs in nasopharyngeal carcinoma. J Virol. 2009 Mar;83(5):2357-67. Epub 2008 Dec 17. Candy B, Chalder T, Cleare AJ, Peakman A, Skowera A, Wessely S, Weinman J, Zuckerman M, Hotopf M. Predictors of fatigue following the onset of infectious mononucleosis. Department of Psychological Medicine, Public Health Laboratory and Medical Microbiology, Guy's, King's and St Thomas' School of Medicine and Institute of Psychiatry, London. Psychol Med. 2003 Jul;33(5):847-55. Katz BZ, Shiraishi Y, Mears CJ, Binns HJ, Taylor R. Chronic fatigue syndrome after infectious mononucleosis in adolescents. Department of Pediatrics, Division of Infectious Diseases, Northwestern University Feinberg School of Medicine and Children's Memorial Hospital, Chicago, Illinois 60614, USA. [email protected] Pediatrics. 2009 Jul;124(1):189-93. Buchwald DS, Rea TD, Katon WJ, Russo JE, Ashley RL. 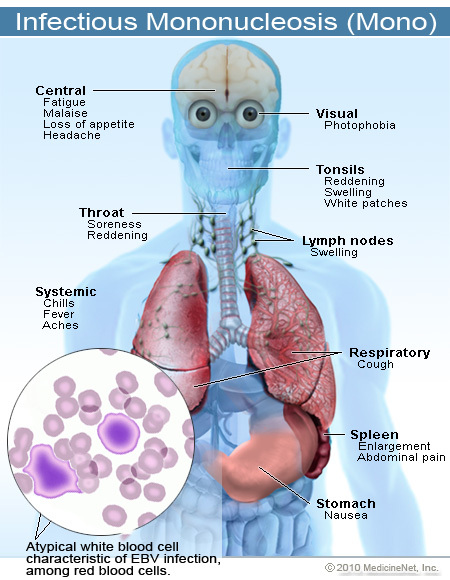 Acute infectious mononucleosis: characteristics of patients who report failure to recover. Department of Medicine, University of Washington, Seattle, Washington, USA. Am J Med. 2000 Nov;109(7):531-7.